You are designing a conventional website that needs to follow the normal visual design standards. This pattern does not necessary apply to artistic web sites where the goal is to display an explicit non-standard style. The human eye 'sees' a web page a certain way, roughly from the top left to the bottom right, and the eye can be guided to see elements in a pleasing and distinctive way. A grid is a technique that comes from print design but easily be applied to web design as well. In its strictest form a grid is literally a grid of X by Y pixels. The elements on the page are then placed on the cell border lines and overall aligned on horizontal and vertical lines. In literature for print design, there are many variations of grids described but most are based on modular and column grids. Often you'll encounter a mix of both types of grids. A grid is an aid for the designer, not a goal by itself. It is therefor ok when some elements are deliberately NOT placed on a grid to create a certain effect. The grid simply creates some rhythm and guidance for the eye. The grid creates a systematic and consistent rule for placing objects. It creates a visual rhythm. It makes it easier and more pleasant for the eye to scan the objects on the page. Page designs that do not use a grid often tend to look 'messy' or 'unprofessional'. 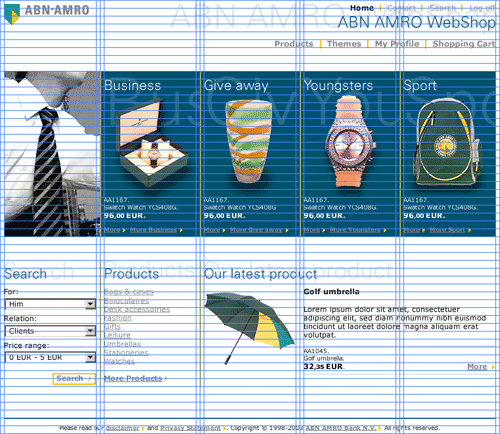 In this example from the Abn-Amro shop you can see a different type of grid being used. Not a strict modular grid, but a grid defining some columns, margins and horizontal evenly spaced guides. From more information on different types of grid systems and when to break the grid system, see the book "Making and Breaking the Grid" by Timothy Samara. Great to educate developers about grids: I'd encourage them all to learn more! 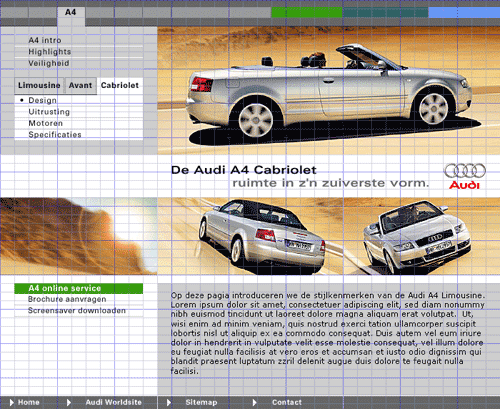 The proportion and style of the grid is very important. The information architect should discuss the page information hierachy with the art director early in the project as the layout grid is developed. I use grids for years when designing a website and even if a design seems to be "artistic", even if the grid doesn't clearly appear, the result is stronger. Thanx alot for article, very educating!